This past Monday I wanted to see whether PostGrant Portal was finally up-to-date with its PTAB Trials data. 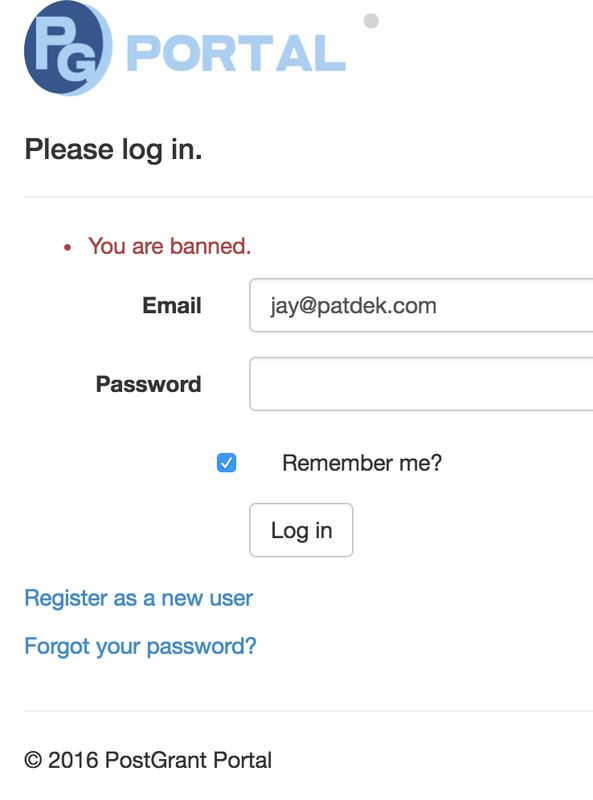 I tried to login, and was met with the message: "You are banned." Now this is funny for a number of different reasons. First, PG Portal reached out to me in June 2016, sending me multiple email messages. My guess is that they scraped different law firm email addresses that appear in IPRs for PTAB Trial proceedings. In other words, they collected my email addresses and then decided to ask me to try out the service. So I did. I registered with my full name, provided them my USPTO registration number, and a number of other items. Take a look at just how much information Post Grant Portal asks you to provide just to register and try the service. [May 6, 2017 update - seems PGP removed 5-10 fields of data previously required.] I provided the requested information and didn't hide that I am associated with Patdek. I used my Patdek email address. Second, and this point will be brief - Didn't it occur to them that I probably had the ability to just register again using another email address? Third, let's consider what it is that that they are so intent on denying access to: PTAB Trial proceedings? a list of search fields? the site layout/UI? Fourth, when Patdek does launch, consider this a personal invite to the folks over at PostGrant Portal to subscribe to the Patdek service. We don't ban subscribers just because a subscriber is associated with a competing service. And I'll make the same pledge to Docket Navigator. You're invited to become a Patdek subscriber too. Why would we make this pledge? Well, last year, shortly after I published this review of the Docket Navigator service, my law firm librarian contacted me to say that Docket Navigator was removing me from its service. And again, this was presumably based on my association with Patdek. Banned twice by being a founder of a service that hasn't yet launched? Both PostGrant Portal and Docket Navigator must be perfecting some real innovations in the field of legal technology that Patdek just hasn't thought of yet. Like searching and downloading documents.